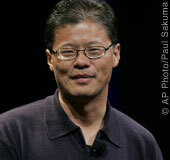 Главная » 2008 » November » 8 » What Jerry Yang Needs To Run Yahoo! What Jerry Yang Needs To Run Yahoo! Jerry Yang has showed the world he has a strong stomach. But he'll need something else to pull Yahoo! out of its slump. On Wednesday morning, Google (nasdaq: GOOG - news - people ) said it was withdrawing from a plan that would have given Yahoo! (nasdaq: YHOO - news - people ) more dollars for its coffers by letting the Internet kingpin monetize some aspects of Yahoo! 's search advertising program--a true punch in the gut for beleaguered Yahoo! That same afternoon, Yang showed up--as promised--at a Web conference in San Francisco where he went through a gut-wrenching on-stage interview with John Battelle, who co-hosted the Web 2.0 conference with Tim O'Reilly. What went wrong with the Microsoft (nasdaq: MSFT - news - people ) deal? Did Yang's ego stand in the way of the deal? Why did Yang come back to run the company? Was he really the right guy for the job? "Look," Yang said, a word he used to begin most of his answers to Battelle. (He said it with the rein-in impatience of a man who has tried to answer these questions more than a few times.) "Look, everyone's replayed [the Microsoft deal] in their minds. I'm no exception." Yang anchored his answer with the response he had made publicly as the negotiations fell apart: "At the right price, we were willing to sell the company." "Today I'd say the best thing for Microsoft to do is to buy Yahoo!" Yang added. But there are no current negotiations with Microsoft to buy Yahoo! outright, he said. What about AOL?, Battelle demanded. Persistent rumors have suggested Yahoo! might absorb the limping Time Warner (nyse: TWX - news - people ) Internet unit. "I can't talk about that!" Yang retorted--the usual corporate response when there are discussions underway. At the heart of the conversation between Yang and Battelle, however, was a painful question: How could Yahoo!, one of the early darlings of the Internet, have ended up as part of the Internet wounded? And what should the mission of the company be now? "It's become increasingly clear to me that Yahoo! is a consumer brand," Yang said. "It's a consumer brand that lets people get what they want on the Internet" with a sort of Yahoo! style. "Yahoo! is the consumer's starting point," he added. Translation: Facebook and Google have become starting points on the Web. If you want to find something, you type www.Google.com. If you want to have social engagement with your friends, you open up Facebook. Yahoo! should be the place "consumers" start when they want to dive into what's going on broadly on the Web--either news or e-mail or other services, Yang seemed to suggest. Where Yahoo! has been late to the party, Yang conceded, has been in tapping the power of the huge, amorphous developer community to build narrow applications. Yahoo! tried a million experiments itself. It should instead, Yang suggested, let developers carry the brunt of that work and focus on creating a platform that supports them. "The opening of the Yahoo! network to be a platform is [a] fundamentally different" approach than the company has taken in the past, Yang argued. Now Yahoo! will let third parties develop applications for the consumers who flock to it. Yang conceded that in the past, many of the applications and functions on Yahoo! coexisted with little interaction or overlap. That's changing, he suggested, citing that a Yahoo! login is becoming the one key a consumer needs to unlock a broader collection of applications. "Why didn't you do that in the first place?" Battelle demanded. And then Yang offered an explanation that shows how dramatically the Internet has changed. "We've always had a company where moving fast is the most important thing. So we didn't have something that said, 'This is [so] important that everyone has to use it…" he said. In other words, working at Internet speed meant every part of Yahoo! ran as fast as it could--but in a thousand different and unrelated directions. Convincing all those groups to pull together in one direction takes monumental discipline--something Yahoo! lacked. And enforcing that kind of discipline will take not just a strong stomach to stand up to grilling and accusations, but an iron fist.